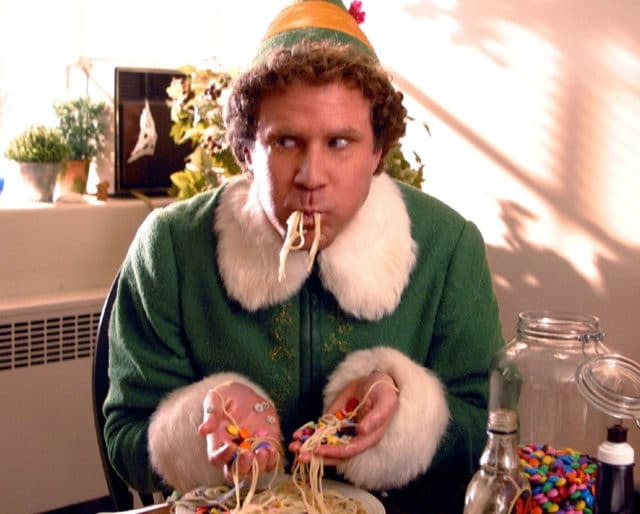 There have been dozens of excellent Christmas movies released through the years, but perhaps none as lovable as Will Ferrell’s Elf. Remember that scene when Buddy is in Walter’s office and answers the phone as “Buddy the Elf, what’s your favorite color?” On December 18, we are all Buddy the Elf. So wear something green, pick up the phone, and celebrate Answer The Telephone Like Buddy The Elf Day! Remember the name of this special day? Answer The Telephone Like Buddy The Elf (day). Well ... do it! What better way to relive this magical movie moment than to rewatch the film? Just make sure you're all stocked up on candy, candy canes, candy corns, and syrup! The internet is filled with awesome Elf memorabilia — if you're looking for a killer Buddy costume, we've got you covered below! Just listen to him! It's hard to hear him for more than five seconds without a smile cracking on your face. There's something intangible about Buddy that makes you want to laugh — and not at him (with him)! Remember when Buddy's going to meet Santa at the mall? It didn't take long for him to sniff-out the imposter — telling him that he smells "like beef and cheese," and that the throne he sits on is made of lies. But Buddy's as nice as they come, and there wasn't an ounce of malice in his words. He's just telling it like it is! Remember the awesome scene where Buddy's playing with the jack-in-the-boxes? All of Will Ferrell's reactions were for real — the release mechanism was controlled off-stage, and was only triggered when Ferrell had been waiting for a while.